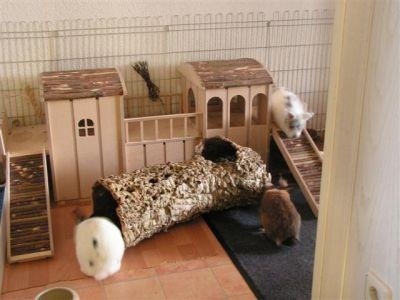 Providing a comfortable and safe environment for your bunny to live in is pivotal to their happiness and their health. 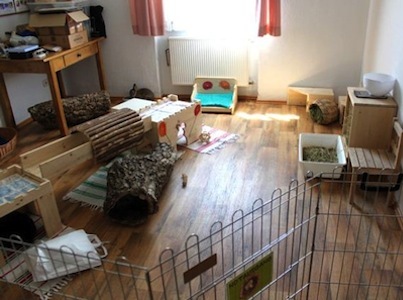 In our article Bunny Proofing a Room, we discuss how to keep your bunny safe by offering tips, tricks and solutions to implement in their living space. This article highlights the not so common in bunny housing ideas, and is intended to go a step further and help you think outside the box, to create something that’s not only adequate but inspired! If you already own a rabbit or are considering adoption, you should be familiar with their needs as far as space and safety are concerned. Our article, Bunny Proofing A Room, is the perfect place to start before you begin your rabbitat planning. It’s important to do your research before you introduce your bun to their new environment, and ideally before you take the time to build it, so that you can be sure there are no hazardous materials or plants that could pose a risk to your bun. There are other considerations besides space and safety when planning a rabbitat. Rabbits are curious little critters with instincts and behaviors that set them apart from other animals. Tailoring their space to accommidate their unique characteristics will make them more comfortable and inspire them to play and explore. Below we discuss a few features that cater to a rabbits needs and should be included in most every rabbitat. Their tendency to take cover and hide should be taken into account. Make sure to provide them with a spot where they can stretch out and feel safe. 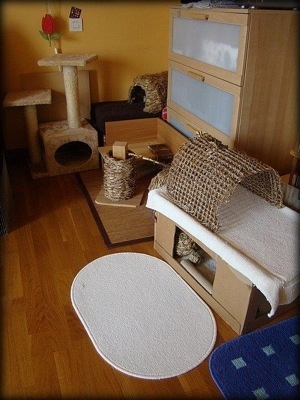 Hidey boxes, cardboard boxes with holes cut out for entry and exit, are often used for this purpose. Tables to seek shelter under is another, as are flexible fabric tunnels, originally designed for cats. You’ll find most of the rabbit rooms pictured below incorporate a rabbit’s desire for privacy and do so in fun and creative ways. Rabbits also like having a high vantage point to look out from. This is another feature you can build into your rabbitat, and one that will allow you to incorporate the use of ramps and stairs to encourage both physical and mental exercise. 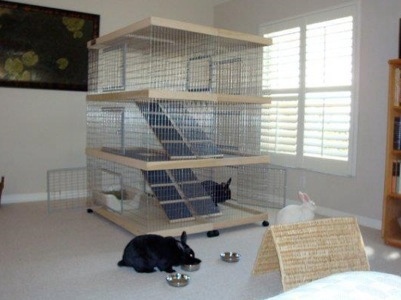 Building “up” allows you to take advantage of the vertical space of a room, giving your rabbit more space to explore. Just be careful if you are using an enclosure, like an x-pen, around your rabbit’s space, as they have been known to use objects available to them to jump over and out of their enclosures. Simply place any boxes or tables in an area that will not allow them an opportunity to escape. If you have given your rabbit an entire room to live, this will not be an issue. 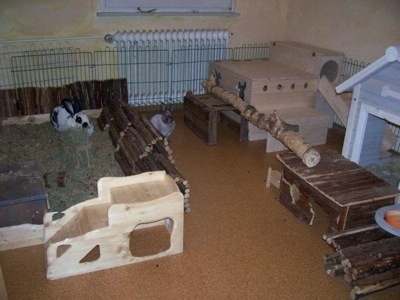 Flooring is also a consideration when building a rabbitat. Hardwood floors can be uncomfortable for rabbits, since it is difficult for them to get traction, leading to mobility problems. The same can be said for tile. Throw rugs are a great solution, as are some bath mats. Choosing a room that is already carpeted might also be a consideration. Keep in mind, the softer the carpet or deeper the pile, the more comfortable it’s likely to be for your bunny. Grass mats are also a popular options as they give your bunny a nonslip surface and are also safe to chew. Since these mats are roughly textured, they should not serve as an overall flooring solution. Rabbits can develop “sore hocks” when exposed to hard surfaces for prolonged periods of time. Wood, tile, grass mats and even some short piled rugs can contribute to sore hocks. A softer surface can help them avoid this painful condition. Since rabbits like to chew, keep an eye on the rugs and carpets within their space. Make sure they aren’t chewing the edges of the rugs or pulling and eating carpet pile. Rabbits who are happy and occupied are less likely to exhibit such behavior, so provide your bunny with an interesting space, toys to play with and plenty of hay to nibble on. The photos below are a collection of images found around the web, the majority coming from Spoiled Rotten Rabbits Facebook page. Though we would love to give credit to the creators of these spaces, we don’t know who owns them. If you recognize the original source of any of these pictures, please feel free to contact us so we can credit the creators. We hope you enjoy the rabbit room ideas and that inspire you to create a beautiful, safe and fun space for your rabbit companions!